One type of binary options trade that is very common is called “One Touch.” Your broker may or may not offer these trades, but many do. They are probably the second most popular type of trade after High/Low. How does it work? With High/Low, you are betting on the direction of price movement, but price does not have to move a particular amount for you to win. It could move a little or a lot, and you would still pull a profit if you picked the right direction. With One Touch trading, you need to be able to predict both the direction of price movement and how far price is going to travel. When you see a One Touch trade, you will notice a goal price listed alongside the expiry time. This is the price that the asset must reach within the expiry period. There is a reason the payouts are higher, though. The broker knows they can afford to offer higher payouts, because traders are less likely to win these types of trades for a couple of reasons. First off, no matter how good or bad a trader is at predicting the direction of price movement, there are only two possible directions price can move in a High/Low trade: up or down. 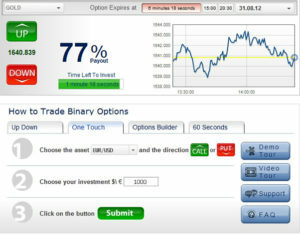 That gives a binary options trader fairly good odds of getting lucky, even if they have no method in place. One Touch trades also specify a value price must reach, and that adds a lot more risk for the casual trader, and makes it far less likely they will win by happenstance. The best time to trade One Touch options is always when the market is moving strongly in a particular direction. Take note of the goal price and the expiry time, and open up your trading charts. If you do not have charting software yet, get it for free here. Your goal is to determine whether the market is trending or entering into a trend that will produce enough movement to get you to the goal price on time. To analyze what you see in front of you, you will need a trading method. You can also look for patterns in price (or price action) which signal the emergence of a new trend. There are specific patterns you can spot at swing-highs and swing-lows which tend to form when there is going to be a reversal in price. There are hundreds of different binary options strategies out there, some which stand alone, and others which can be combined with different methods for even greater success. 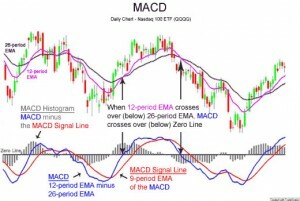 Most rely on some combination of indicators and price patterns. You also may find fundamental trading methods which are ideal if you are an economist. Pay close attention to where support and resistance are likely to form based on price pivot areas in the past when you identify a trade. That way you know where price is likely to hesitate or turn around once it gets going in the direction you specified. Learn about Pivot Points here. Why is this important? It helps you figure out whether you will be able to reach your target price before a trade expires. If the target price is located in front of a pivot area and you expect no great resistance along the way, you may be looking at an excellent trade. If the goal price is on the other side of a pivot area, you may encounter some difficulty getting there, and may not reach it at all. Those are trades you are less likely to win. Be patient, and always wait for the very best setups, and you will be on your way to winning amazing payouts on One Touch binary options!